feel good time: Capri, Positano, Amalfi & Sorrento, Italy. One of my favorite songs has always been "Mambo Italiano" by Rosemary Clooney. "A girl went back to Napoli, because she missed the scenery..." those lyrics resonate with me even deeper now having finally explored the Bay of Naples. 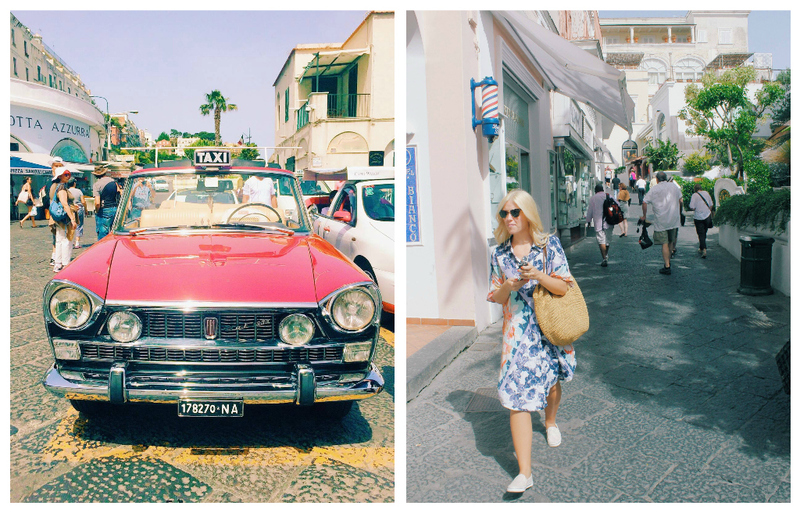 The Isle of Capri was so chic and so beautiful. You know the island attracts the wealthy when the whole island is covered with nothing but designer boutiques as very expensive resorts and hotels. I mean, it was fancy. Fancy, crisp, clean, pastel colors over looking the Mediterranean Sea with speckled white homes clusters next to and on top of one another. It was so picturesque. The gelato was ridiculous, it was probably my favorite taste of Italy's gelato during the whole holiday. It was just so thick and taffy-like and so so creamy. My gosh, I need it now. Along the Amalfi Coast we explored one of my favorite cities in Italy, Positano. We drove up and down the Amalfi Coast, switchback after switchback just along the sea - at times I did think I was going to get a bit sick, but the scenery was well worth the long dive. We did stops along the coast to sip on Amalfi's well- known fresh lemon & orange slush drink. This was by far my favorite taste of the Bay of Naples. Especially since it was so hot out, it was so refreshing. The Bay of Naples is known for their larger than life lemons. Seriously, I kept confusing them for overgrown grapefruits, but they were in fact lemons on steroids and I was in heaven. Having an obsession with lemons, I wanted to take a bit out of them like apples. My sister, Jenna and I, bought maybe five fresh squeezed lemon slushes. We couldn't stop. I did not want to stop. Sorrento was a surprise for me. I really had no thought about the city until we arrived and I was blown away. It's so quaint and beautiful, so many fun shops to explore. And then of course there was Amalfi. Oh how I have fallen in love with Capri, Positano & Amalfi. The beaches in Amalfi were just as how I had seen them and studied them in all of my Italian table books. It was almost as if everything I was seeing was not real and just my imagination. You know, a cruise is a great way of traveling and going from one place to another without having to worry about your luggage. It's relaxing and you feel as though everything is taken care of for you. Though, I will say, as grateful as I am for this trip... 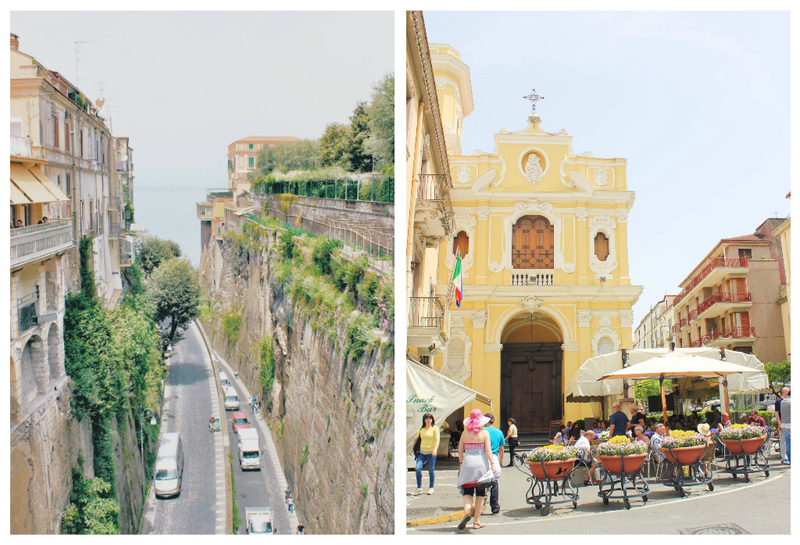 I was so sad that I could only spend a day in the Bay of Naples and having hit four cities, well, you do the math - it gave us so little time in each area. I was dying and felt like a dog with a bone just dangling right in front of me but I couldn't quite have. I was there, I had it all - I had dreamed of coming to the Bay of Naples for all of my life and then I couldn't fully experience it or take it all in. I knew of so many secluded and private beaches and restaurants and activities to do having studied this area for so long and I couldn't do it. I couldn't see it because I was on a time clock and I had to be back to the ship. I sort of wanted to cry, but I had to remind myself that I have been so blessed to even see and get a taste of Capri & the Bay of Naples. I know now though, that I will be coming back and this time, I won't be going anywhere else for a good few weeks. I am going to be on lock down and on a true holiday exploring the Amalfi Coast and really, truly, fully living the mambo Italiano dream.